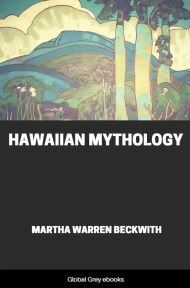 This is Martha Beckwith's monumental study of Hawaiian mythology. She gives all available variants of each myth or legend, including versions from other Pacific islands including Tahiti, Tonga, Samoa and others. This is primarily a critical edition of the key Hawaiian myths, and Beckwith largely does not attempt to interpret the texts, rather to examine both variant narratives and core folklore motifs. The book covers every significant theme in Hawaiian mythology, from the origin myths of the Hawaiian gods and goddesses, to more recent legends of star-crossed lovers. She also covers such topics as Kahunas (sorcerors) and Menehunes (fairies). HOW traditional narrative art develops orally among a nature-worshiping people like the Polynesians can be best illustrated by surveying the whole body of such art among a single isolated group like the Hawaiian with reference to the historical background reflected in the stories and to similar traditions among allied groups in the South Seas. Something of the slant of thought upon which society is regulated must be realized as it is brought out in particular instances. For this purpose a division of the subject into stories of gods and ghosts, of ancestors as they appear in the genealogies of chiefs, and of fiction in the form of legend and romance has been here adopted, although one form often overlaps another. Hawaiians use the term kaao for a fictional story or one in which fancy plays an important part, that of moolelo for a narrative about a historical figure, one which is supposed to follow historical events. Stories of the gods are moolelo. They are distinguished from secular narrative not by name, but by the manner of telling. Sacred stories are told only by day and the listeners must not move in front of the speaker; to do so would be highly disrespectful to the gods. Folktale in the form of anecdote, local legend, or family story is also classed under moolelo. It is by far the most popular form of story-telling surviving today and offers a rich field for further investigation, but since no systematic collecting has been done in this most difficult of forms for the foreign transcriber, it is represented here only incidentally when a type tale has become standardized in folklore. Nor can the distinction between kaao as fiction and moolelo as fact be pressed too closely. It is rather in the intention than in the fact. Many a so-called moolelo which a foreigner would reject as fantastic nevertheless corresponds with the Hawaiian view of the relation between nature and man. A kaao, although often making adroit use of traditional and amusing episodes, may also proceed quite naturally, the distinction being that it is consciously composed to tickle the fancy rather than to inform the mind as to supposed events. The Hawaiians worshiped nature gods and these gods entered to a greater or less extent into all the affairs of daily life, played a dominant part in legendary history, and furnished a rich imaginative background for the development of fictional narrative. Hence the whole range of story-telling is included in the term mythology. Among Hawaiians the word for god (akua) is of indeterminate usage. Thus any object of nature may be a god; so may a dead body or a living person or a made image, if worshiped as a god. Every form of nature has its class god, who may become aumakua or guardian god of a family into which an offspring of the god is born, provided the family worship such an offspring with prayer and offerings. The name kupua is given to such a child of a god when it is born into the family as a human being. The power of a kupua is limited to the district to which he belongs. In story he may be recognized by a transformation body in the form of animal or plant or other natural object belonging to him through his divine origin, and by more than natural powers through control over forms of nature which serve him because of family descent. As a human being he is preternaturally strong and beautiful or ugly and terrible. The name comes from the word kupu as applied to a plant that sprouts from a parent stock, as in the word kupuna for an ancestor. So the word ohana, used to designate a family group, refers to the shoots (oha) which grow up about a root-stock. The terms akua, aumakua, and kupua are as a matter of fact interchangeable, their use depending upon the attitude of the worshiper. An akua may become an aumakua of a particular family. A person may be represented in story as a kupua during his life and an aumakua if worshiped after death. A ghost (lapu) is called an akua lapu to designate those tricky spirits who frighten persons at night. Nonhuman spirits who dwell in the myriad forms of nature are the little gods (akua li‘i) regularly invoked in prayers for protection. "Little gods who made not heaven and earth" they were called in contempt, after the introduction of Christianity had brought the scientific viewpoint to the contemplation of the forms and forces of nature. An animistic philosophy thus conditions the Hawaiian's whole conception of nature and of life. Much that seems to us wildest fancy in Hawaiian story is to him a sober statement of fact as he interprets it through the interrelations of gods with nature and with man. Another philosophic concept comes out in his way of accommodating himself as an individual to the physical universe in which he finds himself placed. He arrives at an organized conception of form through the pairing of opposites, one depending upon the other to complete the whole. So ideas of night and day, light and darkness, male and female, land and water, rising and setting (of the sun), small and large, little and big, hard and light (of force), upright and prostrate (of position), upward and downward, toward and away from (the speaker) appear paired in repeated reiteration as a stylistic element in composition of chants, and function also in everyday language, where one of a pair lies implicit whenever its opposite is used in reference to the speaker. It determines the order of emergence in the so-called chant of creation, where from lower forms of life emerge offspring on a higher scale and water forms of life are paired with land forms until the period of the gods (po) is passed and the birth of the great gods and of mankind ushers in the era of light (ao). It appears in the recitation by rote of genealogies in which husbands and wives are paired through literally hundreds of generations. It is notable that in similar genealogies such as the Hebrew, in which, as introduced by the missionaries, Hawaiians showed extraordinary interest, males alone are recorded. Gods are represented in Hawaiian story as chiefs dwelling in far lands or in the heavens and coming as visitors or immigrants to some special locality in the group sacred to their worship. Of the great gods worshiped throughout Polynesia, Ku, Kane, Lono, and Kanaloa were named to the early missionaries.